In a project led by investigators at UC San Francisco , scientists have devised a new strategy to precisely modify human immune-system T cells, using the popular genome-editing system known as CRISPR/Cas9. T cells play important roles in a wide range of diseases, from diabetes to AIDS to cancer, so this achievement provides a path toward CRISPR/Cas9-based therapies for many serious health problems, the scientists say. It also provides a versatile new tool for research on T cell function. Specifically, the researchers disabled a protein on the T-cell surface called CXCR4, which can be exploited by HIV when the virus infects T cells and causes AIDS. The group also successfully shut down PD-1. Scientists have shown that using drugs to block PD-1 coaxes T cells to attack tumors. The CRISPR/Cas9 system makes it possible to easily and inexpensively edit genetic information in virtually any organism. T cells, which circulate in the blood, are an obvious candidate for medical applications of the technology, as these cells are at the center of many disease processes, and could be easily gathered from patients, edited with CRISPR/Cas9, then returned to the body to exert therapeutic effects. Cas9, an enzyme in the CRISPR system that makes cuts in DNA and allows new genetic sequences to be inserted, is generally introduced into cells by using viruses or circular bits of DNA called plasmids. Then, in a separate step, a genetic construct known as single-guide RNA, which steers Cas9 to the specific spots in DNA where cuts are desired, is also placed into the cells. Now, as reported in an open-access paper online in Proceedings of the National Academy of Sciences on July 27, 2015, the team has cracked these problems by streamlining the delivery of Cas9 and single-guide RNA to cells. In lab dishes, the group assembled Cas9 ribonucleoproteins (RNPs), which combine the Cas9 protein with single-guide RNA. They then used a method known as electroporation, in which electrical field essentially punches tiny holes in membranes to make them more permeable so that these RNPs can we quickly delivered to the interior of the cells. With these innovations, the researchers successfully edited CXCR4 and PD-1, even knocking in new sequences to replace specific genetic “letters” in these proteins. The group was then able to sort the cells, using markers expressed on the cell surface, to help pull out successfully edited cells for research, and eventually for therapeutic use. The new work was done under the auspices of the Innovative Genomics Initiative (IGI), a joint UC Berkeley-UCSF program co-directed by Berkeley’s Jennifer Doudna, PhD, who is world-renowned for her pioneering research on CRISPR/Cas9, and Jonathan Weissman, PhD, professor of cellular and molecular pharmacology at UCSF and a Howard Hughes Medical Institute (HHMI) investigator. Recent reports of CRISPR/Cas9 editing of human embryos for possible heritable germline modification have stirred up an ethical controversy. But with this new protocol, T cells are created anew in each individual, so modifications would not be passed on to future generations, explained Alexander Marson, PhD, a UCSF Sandler Fellow and an affiliate member of the IGI, and senior and co-corresponding author of the new study. He hopes that Cas9-based therapies for T cell-related disorders, which include autoimmune diseases as well as immunodeficiencies such as “bubble boy disease,” will enter the clinic in the future. The research was supported by a gift from Jake Aronov, and by the UCSF Sandler Fellows Program, the National Institutes of Health, the National MS Society, and the Howard Hughes Medical Institute. T-cell genome engineering holds great promise for cell-based therapies for cancer, HIV, primary immune deficiencies, and autoimmune diseases, but genetic manipulation of human T cells has been challenging. Improved tools are needed to efficiently “knock out” genes and “knock in” targeted genome modifications to modulate T-cell function and correct disease-associated mutations. CRISPR/Cas9 technology is facilitating genome engineering in many cell types, but in human T cells its efficiency has been limited and it has not yet proven useful for targeted nucleotide replacements. 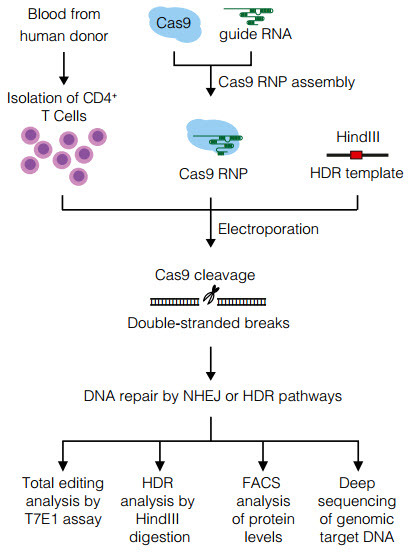 Here we report efficient genome engineering in human CD4+ T cells using Cas9:single-guide RNA ribonucleoproteins (Cas9 RNPs). Cas9 RNPs allowed ablation of CXCR4, a coreceptor for HIV entry. Cas9 RNP electroporation caused up to ∼40% of cells to lose high-level cell-surface expression of CXCR4, and edited cells could be enriched by sorting based on low CXCR4 expression. Importantly, Cas9 RNPs paired with homology-directed repair template oligonucleotides generated a high frequency of targeted genome modifications in primary T cells. Targeted nucleotide replacement was achieved in CXCR4 and PD-1 (PDCD1), a regulator of T-cell exhaustion that is a validated target for tumor immunotherapy. Deep sequencing of a target site confirmed that Cas9 RNPs generated knock-in genome modifications with up to ∼20% efficiency, which accounted for up to approximately one-third of total editing events. These results establish Cas9 RNP technology for diverse experimental and therapeutic genome engineering applications in primary human T cells.